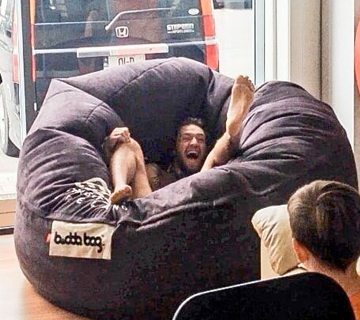 Buddabag has proven itself over the last 10 years to be a fun, functional & extremely comfortable product and now it’s been made even better!!! 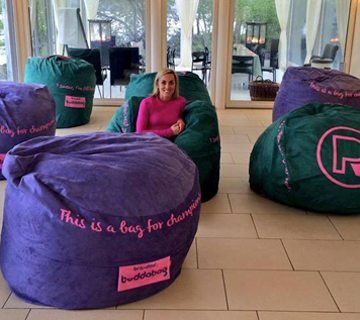 We can design your branded buddabag to any digital pantone colour, design or specification. 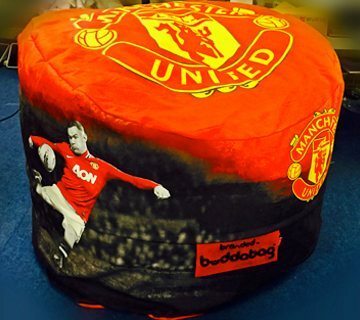 If it can be printed on paper, we can print it on a buddabag, no matter how wacky or wonderful… try us?? Limitless design possibilities is all thanks to a revolutionary new printing process known as Dye-Sublimation. This allows us to digitally print onto our premium micro-suede fabric by individually dying each fiber to its root. This means that unlike historic screen printing, your Buddabag will never fade! Our revolutionary process means you’re easily detachable cover is fully machine washable and tested up to 500 washes for its longevity & durability. As branding has become so important, our team take meticulous care and thought into following the client’s brand guidelines & brief as we bring you through our 6 stages of design/production. 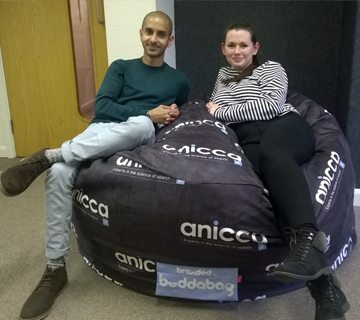 The Buddabag as we know it, is two separate entities, the inner cotton bag, holding the memory foam and the detachable machine washable cover. As our branded covers can be bought separately, clients use our branded Buddabags, campaign after campaign, while just purchasing new covers for a fraction of the cost. Lead-time is 7-21 working days depending on quantity and specification. As we are based in the Republic of Ireland, UK companies can avail of VAT free purchases. Then fill in the below and we’ll get back to you to discuss! 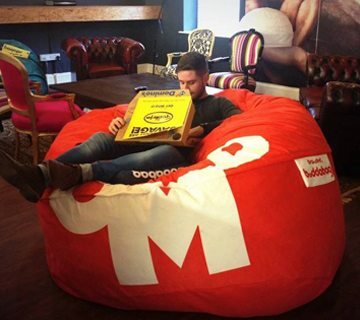 Some Great Brands With Buddabag Style! 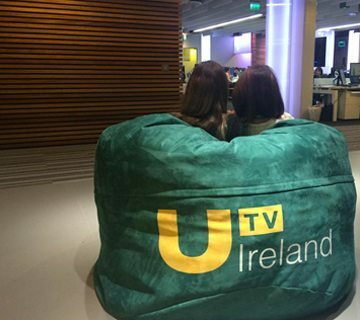 ITV Television Network – In 2014, ITV came to us and said they were launching a new television network for the Irish market (UTV Ireland). They were looking for a unique gift to give to the top 35 advertising agencies in the country to get their name out their and keep them fresh in the minds of advertising execs. After going through our design process with one of our 5 in house designers tweaking and adjusting the design until the client was happy. We then branded 35 Buddabags in their exact pan-tone colours with their logo being a very prominent aspect of the design. A major soft drinks company bought 20 plus branded Buddabags to aid the launch of a new product. The Buddabags were part of a roadshow that went from University to University for a couple of days at a time. This meant that their new brand was displayed on functional, comfortable furniture that all the students lounged and enjoyed in while enjoying their new soft drink. The exposure was far more effective than print media as the fun element and usability of Buddabags played a big part in getting great interaction on social media from the students. 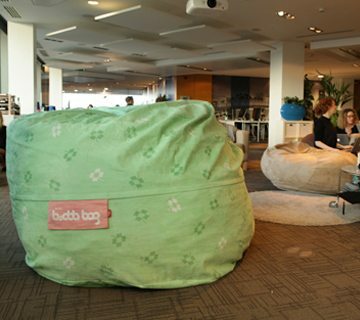 Dropbox.com – The lovely team at Dropbox came to us to find some “chill out” furniture for their recreation room, as a lot of their staff had experienced Buddabags in some of our other clients offices, like Google, Facebook, Intel and Microsoft. So we took them down our design process and sculpted them the perfect Dropbox blue Buddabags for the staff to enjoy. 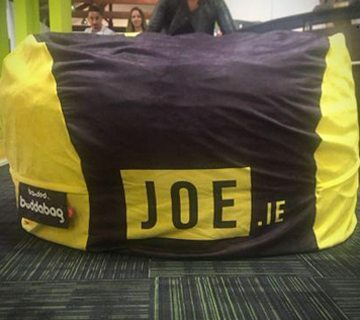 English Rugby Union – In 2014, we auctioned off a one off Irish Rugby Buddabag signed by the team for charity. On the back of this, the English Rugby team subsequently bought a couple of our largest bags for the players to crash onto after a long day at Pennyhill and to say they love them is an understatement! This is a Bag for Champions!